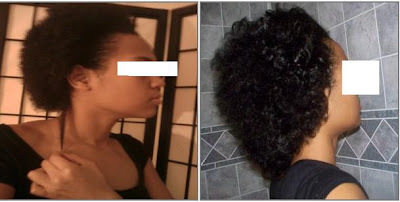 Strength Before Length: Shrinkage Comparison !! This is my hair after a wash and go, and also after combing out my rollerset. Wow ! What a difference... I love rollersetting for these cold winter months, it's nice to have hair on my neck once again. Rollersetting every week is helping my patience while I'm growing out this TWA !! What I love most about rollersetting is that it becomes easier with time, my hair becomes "trained" to stay straight, and for longer, and when I prepoo or wash my hair, the curls snap right back and they have absolutely NO heat damage !! I agree!! I like seeing my length too =) I'm about to upload a 2 part video on my rollerset!! I like roller setting my hair so much!! thanks for the inspiration girly!! I Loved the Videos on it !!! I'm going to try it your way with the perm rods so that I can keep it curly and stretched =D ... So thank you too Big Sis !! !